I apologize for my week-long absence from this blog; I was indisposed. Now I am baaaaaack. And I've won a contest. Over at one of my favorite blogs, Ruthless Knitting, the proprietor Ruth posted the photo of a bizarre ceramic object as a clue to her secret knitting project. If you guessed correctly you could win a prize of some yarn. Well, dear reader, my guess ("piggie, cowie, bunny toy") came closest and I won this. It is 2 skeins of Lorna's Laces Shepherd Sock in the color Amish. It came with a nice card and certainly cheered my week. After winding and photographing this yarn, I see why it is called Amish. It has the glowing against dark colors of an Amish quilt. Striking and perfect for socks to wear with jeans. Thank you Ruth. Now previous to my good fortune I had actually been thinking about making this the year of the sock. Now I have to do it. My next project will be to make the first pair of socks I have knit in thirty years. Thirty years ago I took up a set of double pointed aluminium needles (wood and bamboo were rare then) and made a pair of red and blue striped woolen socks. I wanted to make something special for a friend. I had no trouble knitting them. Years later though, I am all thumbs. I want to try them on two circulars (which is a variation of Shetland knitting according to Principles of Knitting), but I am determined to re-master double pointeds first. 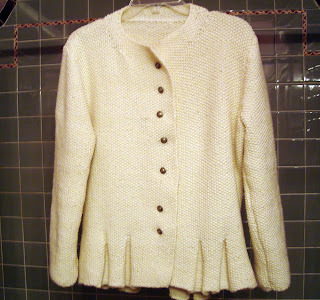 And pictured below is my latest finished object, completed yesterday, the Darcy Jacket from Kim Hargreaves' Heartfelt collection. I am disappointed. I made the size XL (40" chest) and it fits pretty well. The length is perfect (because I have a long torso), it's a little big in the shoulders (because I am shrinking), and a little tight in the waist (because that's where all the fat collects now), but not so you'd notice. But, as I seem to do so often, I made the wrong yarn choice. When I first swatched the Knit Picks Merino Style DK I bitched and moaned about it because I thought it was too chunky for a dk weight. But it fit the guage for this sweater perfectly, same needle size (US #6) and everything. Now I see that I just don't like this yarn. There is something tawdry about it. It is too soft for this jacket style. (I often find myself wishing for a crisper yarn.) The pattern called for a Rowan cotton yarn, but it would have been too heavy in 100% cotton. Due to the constant k/p stitch alteration, it sucked up yarn - 1,700 yards for this size. At least I used up all the Merino Style. I will never buy that yarn again. With all that, the sweater is wearable; maybe I'll like it better in the wearing. Now for my embarrassing confession: I made the sleeves 4" too long. Further confession: I don't know my exact sleeve length. I just make the length given for 2 sizes smaller than the one I'm knitting, and it usually works. This time, there was an error in the pattern printing. The length was given in inches and centimeters, and the lengths didn't match. The inch measurements seemed too short (ie: 13") and the centimeter measurements seemed too long (47cm, which is 18", not 13"). So I followed the centimeters. Thanks to TECHknitter on Ravelry (blog bookmarked on the right) I was able to (somewhat) calmly snip a stitch where I wanted the sleeve to end, separate off the excess length, catch the live stitches, re-knit one row and bind off. It worked! Congratulations on winning the contest, and commiserations on the Darcy not coming out quite as you would have wished (although it looks quite lovely on the hanger). The Darcy looks beautiful from a distance and not at all tawdry. I know how disappointing it is when the knitted item doesn't match the expectations in your mind. I'll bet it looks good on you! I think the Darcy looks lovely; I hope that your disappointment fades as you adjust to the difference between how you imagined it and how it actually is. That was very brave about the sleeves. Congratulations on winning the contest! Lucky you. Started knitting the socks with that yarn yet?